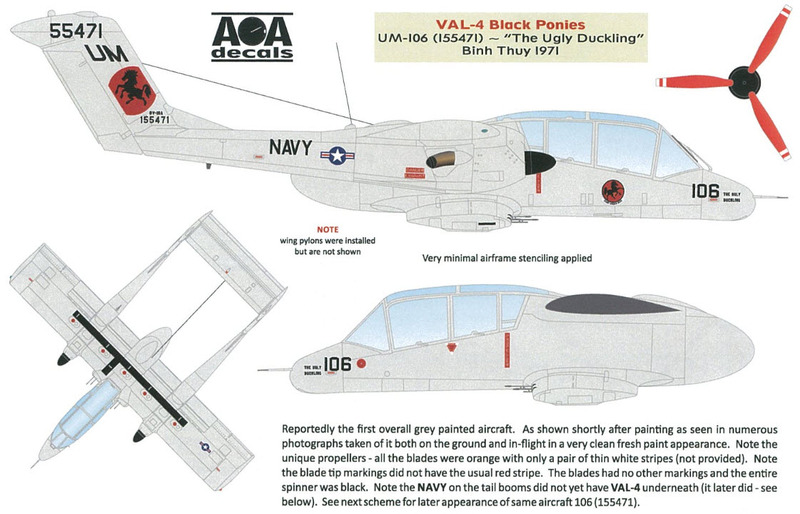 With the highly anticipated Kitty Hawk 1/32 OV-10A Bronco coming this month we thought it was a great time to start looking for alternate to the kit decals to use. 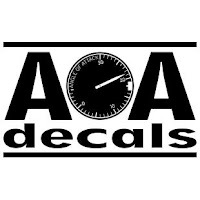 AOA decals are a company’s work we had not seen as of yet. So what better reason to give these a good going over – see what we thought about them in our in-depth review. 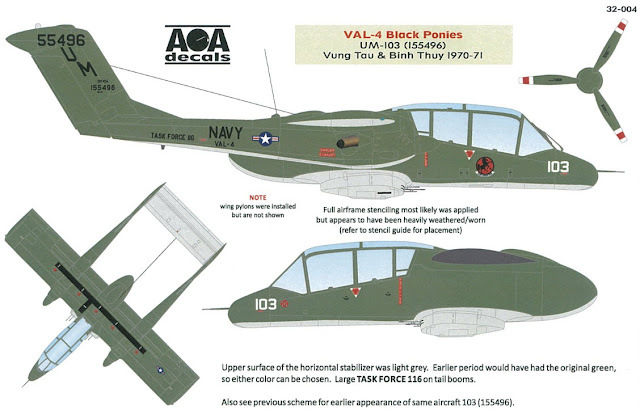 this decal sheet is available in both 1/32nd and 1/72nd scales. 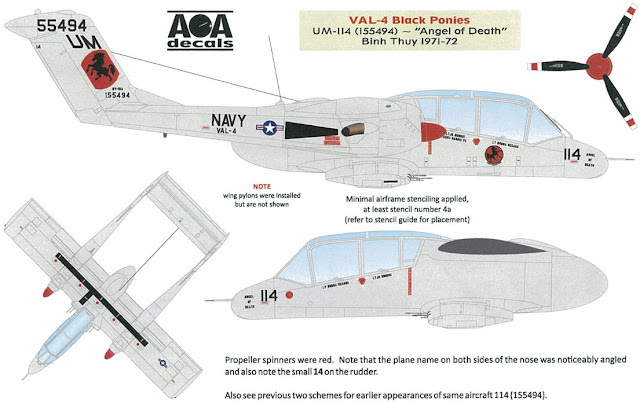 AOA decals are a fairly new company on the modelling scene. 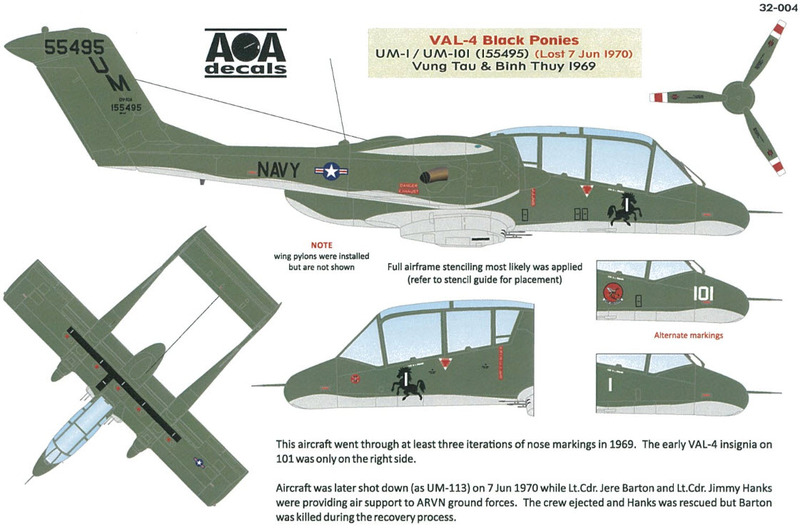 They have several decal sheets covering aircraft from the Vietnam War. Already they have released some nice looking A-6A Intruder decal sheets but their other main area of interest it seems is with the new Kittyhawk OV-10A/C Bronco kit. This really popular aircraft has attracted a lot of interest and my local hobby shop has sold out twice in the “D” Version kit which was released early this year. 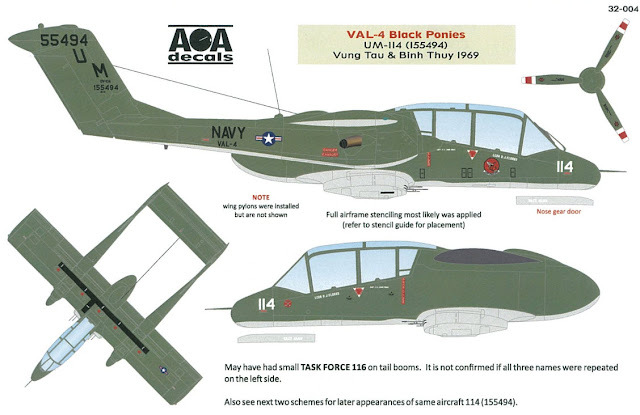 The earlier Vietnam Era Bronco is set to be even more popular still so a great choice of aircraft to focus a decal sheet and stencil markings on. Some pretty extensive (some might say it would have been exhaustive) research has been done with the help of the book on the “Black Ponies” and the website dedicated to the Bronco in the Vietnam Conflict http://www.blackpony.org/ . This website is a treasure trove of information and I can see it was a primary resource for the making of this sheet as so many of the aircraft seen on this sheet are there. It is two hours of documentary that is just so interesting if you are at all interested in the conflict, the aircraft or the missions. The video talks about the men, the missions and what happened when they were flying missions and when they weren’t. This and the Black Pony website would be a primary source of knowledge for researching a sheet like this one. You should do yourself a favour and investigate both the website and this great video yourself. VMO-6 - tail Code WB were called the Tomcats and flew their OV-10s from November 1, 1968 through to January 1, 1977. They were based first at Key Ha with MAG-36, then moved to Quang Tri RVN as part of ProvMAG-39. The squadron flew all three aircraft types until combat operations ceased on October 2, 1969. 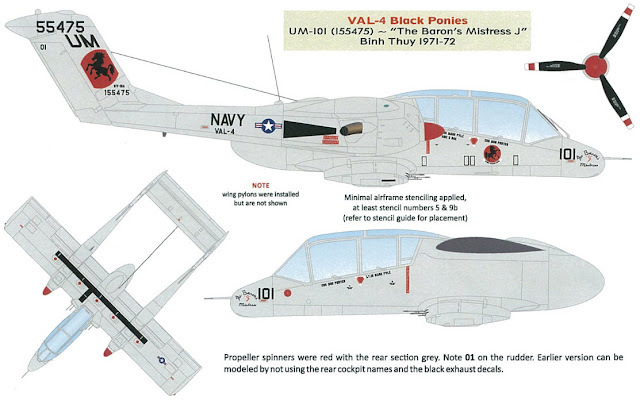 The Squadron left RVN for MCAS Futenma (Okinawa, Japan) on October 8, 1969. Although VS-41, Sea Control Squadron 41 was a training squadron of the United States Navy for crews of anti-submarine aircraft. 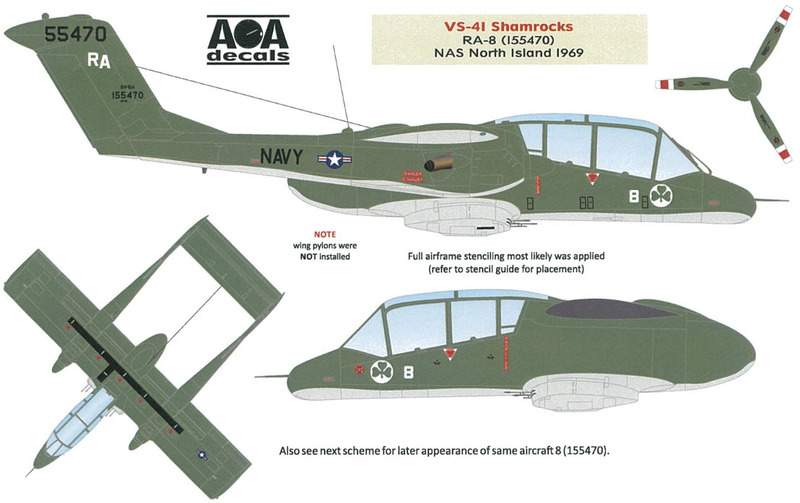 Tailcodes for their aircraft were “RA” and the Shamrocks received their first OV-10 (BuNo 155460) on October 2, 1968. 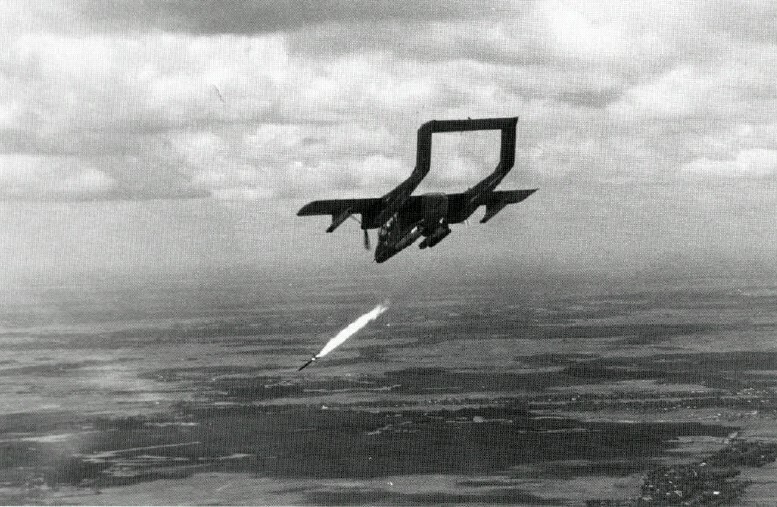 The squadron provided initial crew and replacement crew training for VAL-4. One aircraft (155460) was lost in a crash August 7, 1970 at North Island. The crew was killed. 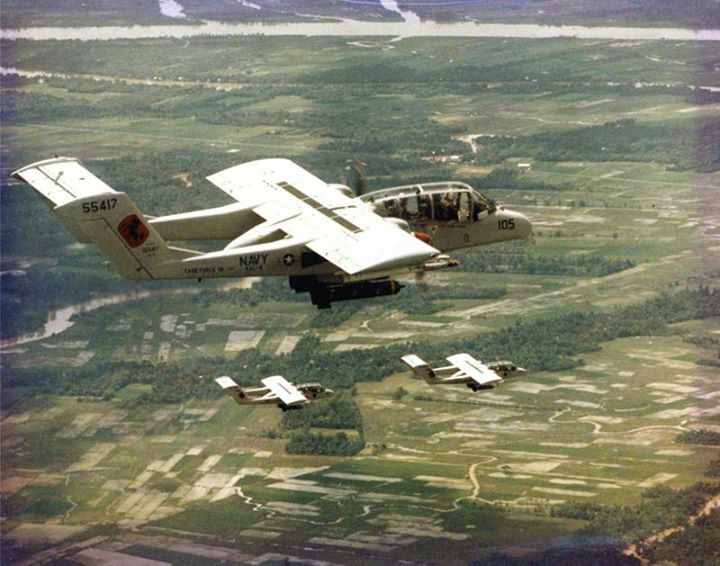 They had 4 OV-10s until February 3, 1972. Tail Code: “UM”: VAL-4 operated from 1969 until 1972. Known as the Black Ponies 'Black Ponies' VAL-4 operated in III and IV CORPS, RVN from April 1969 in support of Navy SEAL and Riverine operations in the Mekong River delta. 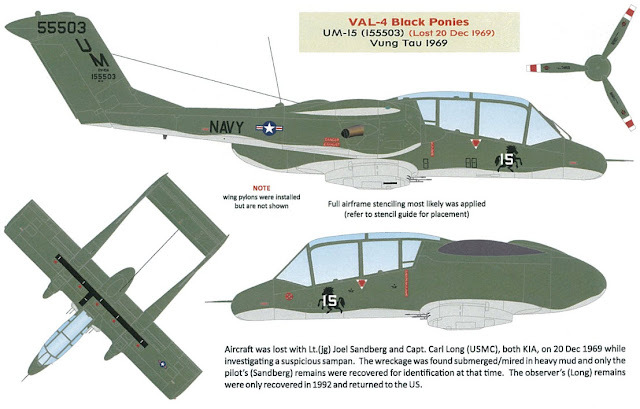 The squadron had two detachments, Det. "A" assigned to the Air Force Base at Binh Thuy and Det. 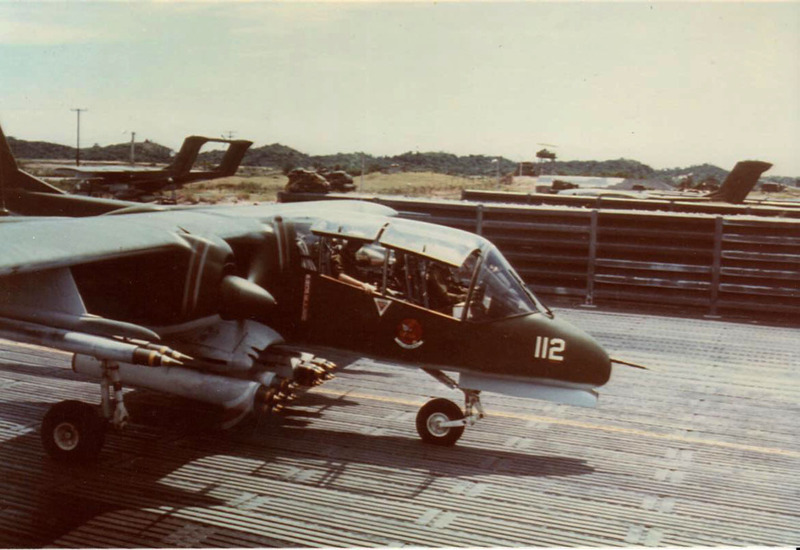 "B" assigned at the Vung Tau Army Airfield. New facilities for VAL-4 on the Vietnamese Air Force Base at Binh Thuy and the consolidation of VAL-4's operating units lead to the disestablishment of Det. "B" on July 1, 1970. The last combat mission was flown on March 31, 1972 and the unit was deactivated on April 10. Instead of telling you about everything then going through it I thought I would walk you thru page by page with what comes along with the decals. 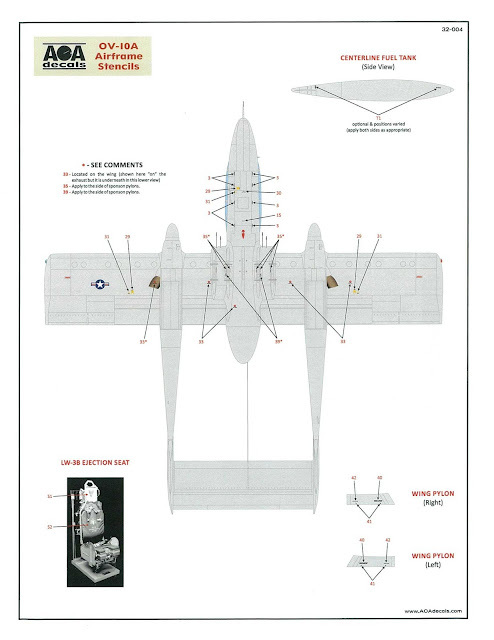 Starting at the extensive suite sixteen pages of instructions on eight full page colour sheets, also a stencil sheet placement sheet has been added so you can better see where some of these markings are placed on the airframe. 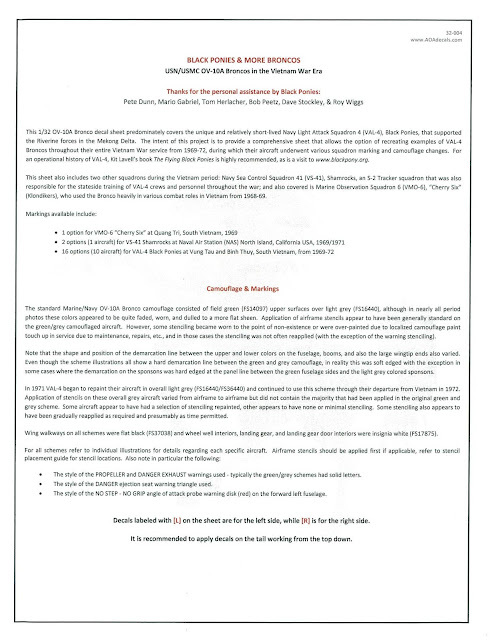 In the past we have lauded companies for supplying good quality colour printed instructions with their decals. This offering is printed on sixteen sheets of colour printed A4 paper and you really get a sense of “Wow” when you open the zip loc bag and see it all there for you. So much to take in is somewhat of a curse of riches here – I bet you can think of two or three subjects amongst the many to choose from. We will go from the first page till the end and then look at the schemes and then the decals themselves. 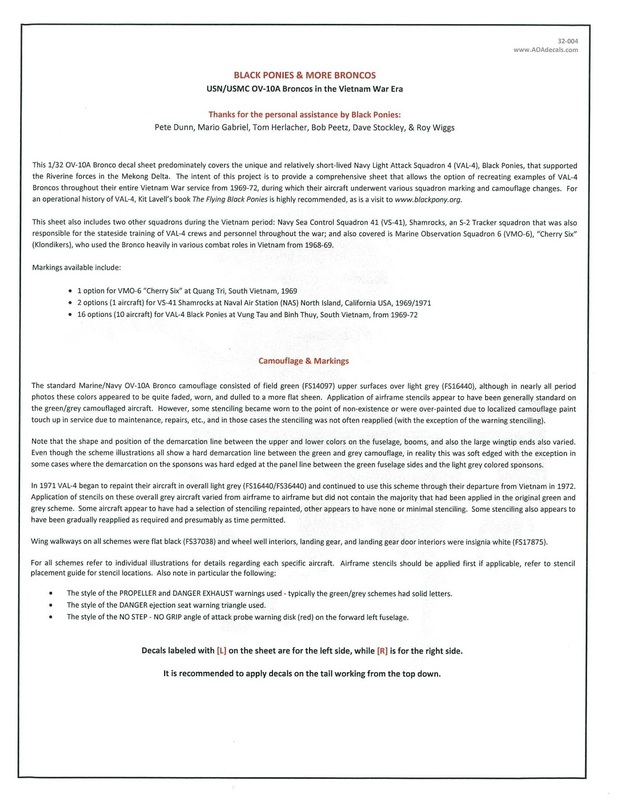 The first page we look at is on the rear of the cover page. 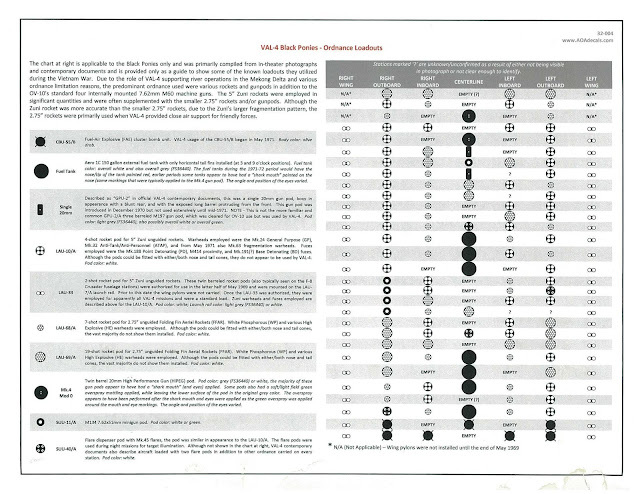 This is a graphical map if you like of what the ordinance was (with little symbols next to it) and on the other side of the page is the hard points map where the positions of the weapons on any given mission that could be used. This map is a real bonus for two reasons more than the obvious. 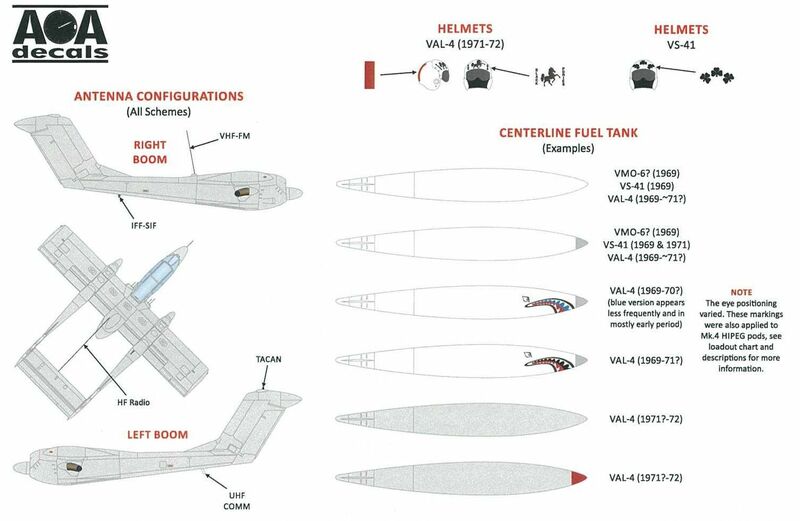 The weapons descriptions show how and sometimes the colours that applied to this ordinance. The load-out layout is great because you can correctly place the weapons on your kits now with no fear of some dude coming up to you and saying “You know you got that wrong…” It is a really helpful and a good way to start off. The next pages tell you what to expect from this decal release, and they point out as I did earlier some good reference point to look for info on this release and they thank the people who have helped with this release - namely Pete Dunn, Mario Gabriel, Tom Herlacher, Bob Peetz, Dave Stockley, and Roy Wiggs for their help on these decals. 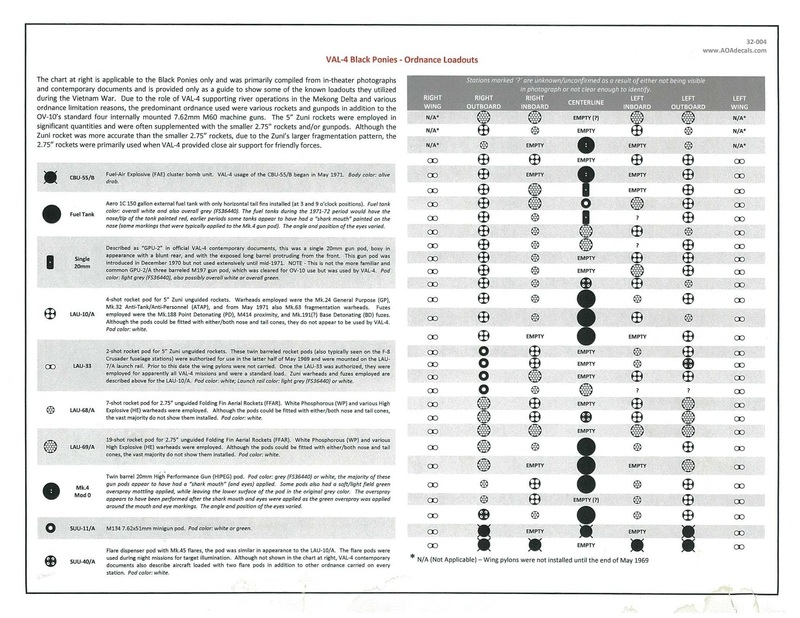 This sheet also briefly and succinctly helps you with nots on how the colours were applied and where they were applied including some stencilling work. That is not the end of the stencilling - several pages more to come! The next two pages are full of stencil positions. 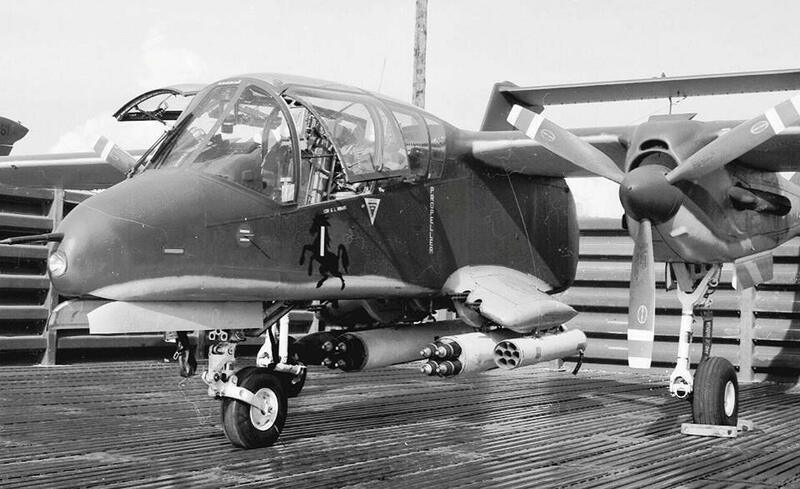 All views are supplied with close ups of the boom tail and cockpit sections as well as the top of the Bronco. 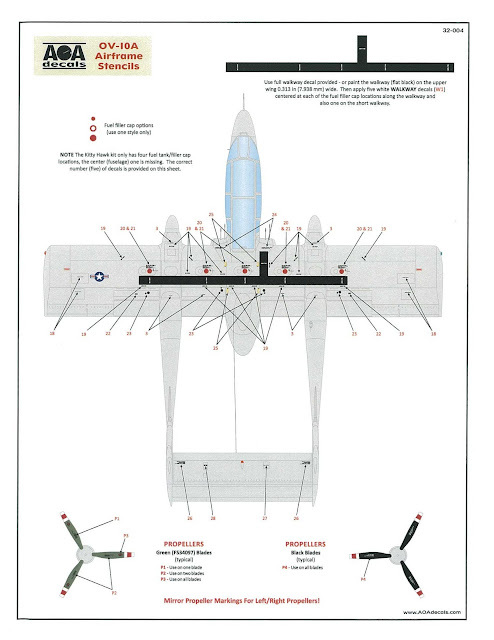 Walkways, fuel fulling points and propellers are all “found and fixed” on the top down view. 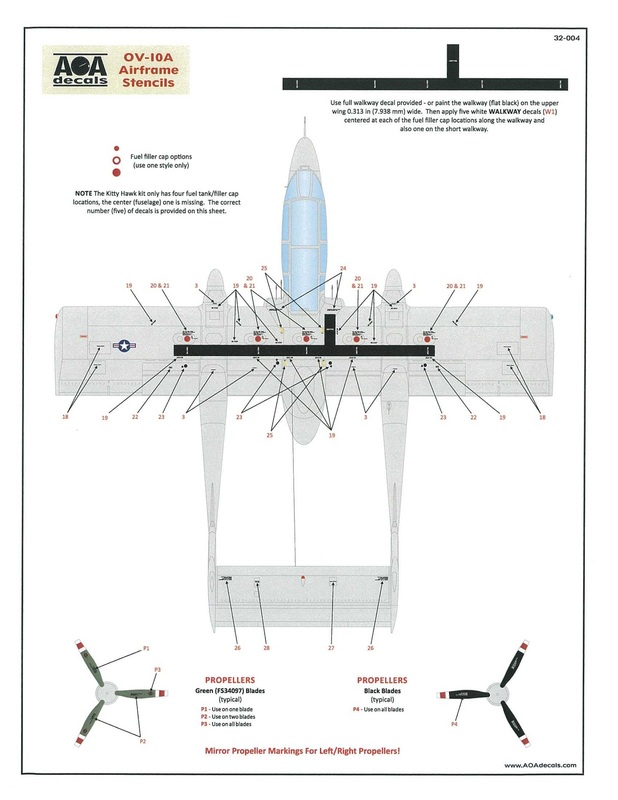 The underneath of the aircraft is also shown – much to AOA’s credit. 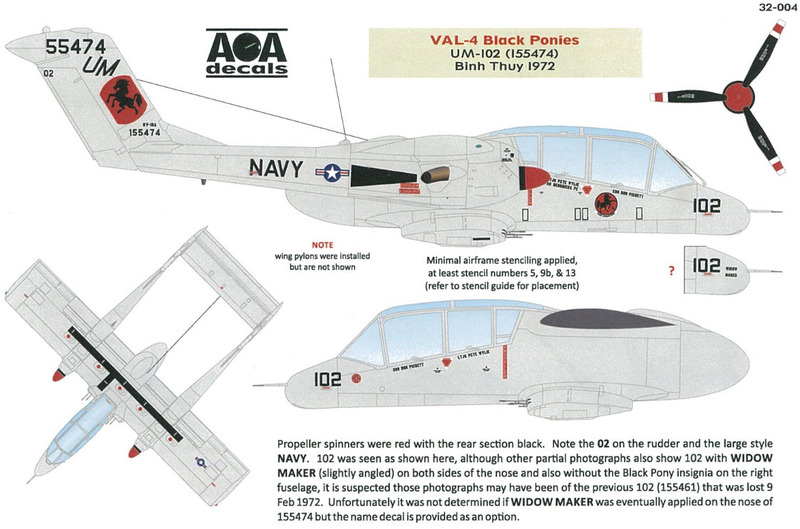 Details on the fuselage and underwing pylons are noted as are the markings on the ejection seat. Comprehensive to say the least. I haven’t ever seen this many views and notations of the details of the colouring and stenciling. Great stuff! 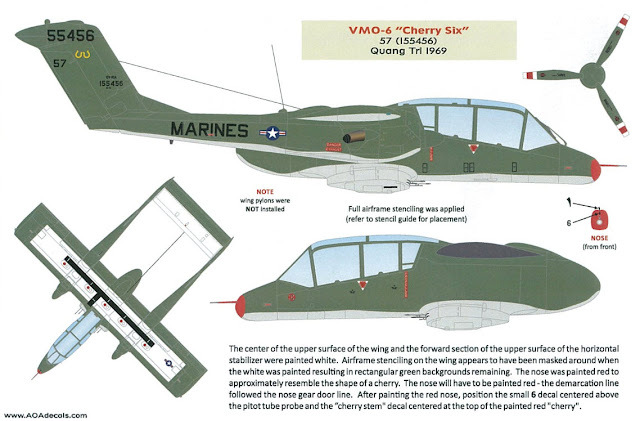 Marine Observation Squadron 6 (VMO-6), “Cherry Six” (Klondikers), who used the Bronco heavily in various combat roles in Vietnam from 1968-69. Navy Light Attack Squadron 4 (VAL-4), Black Ponies, allowing the option to represent one of many possible VAL-4 Broncos throughout their entire Vietnam War service from 1969-72. There are two decals sheets included here that cover all of the options we have looked at. The larger sheet is 20cmH x 25cmW, and it is accompanied by the stencil sheet which is 10cmH x 21cmW. Both of these sheets are printed by the market leader Cartograf. Now we haven’t had any experience with applying these decals as of yet, but to look at they are semi matt finished and with a minimal amount of carrier film. The colours are nice and not too dark where the whites do not look opaque.. The printing is very well done and you can see here by looking at these blown up that the printing is in register and aligned properly. Firstly on the stencil sheet. That is all well and good but how DO they perform? Let’s have a look at them in action on a scrap piece of model to see how they hold on.. I used the under hull of a tank – the only bit of a model i didn't mind being painted, and then on the painted black base I added two coats of future underneath it. Allowing it to dry properly I placed the decals on top of the glossy surface making sue i put the decals on some really hard places that showed if they clung hold or not. I found that these whites were indeed strong and that the decals settled tightly to the surface over the raised surfaces and weld detail seams I made sure I put them over.I used some Mirco Sol/ Set and as you see it is without any top gloss coat - so you can better see how they performed. Full the stencil sheet is approximately 4 x 8 inches and provided for us are enough for one Bronco. There is also a separately available stencilling sheet (32-005) also available to purchase separately from AOA if you do not choose to use their decals. 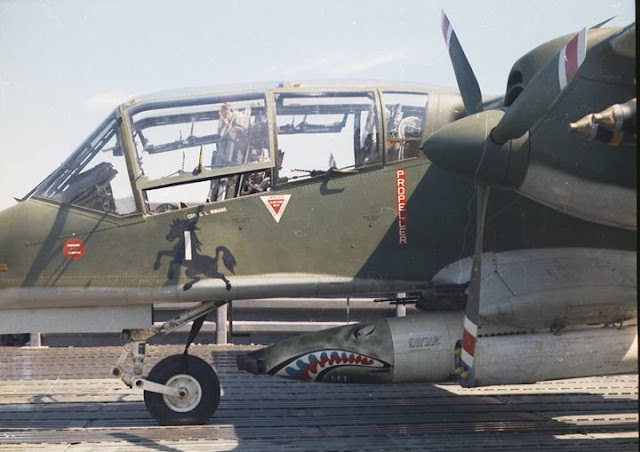 So there we have it – the deals are researched very well with a lot of thought going into them, the choices are some of the most in numbers I have EVER seen on a 32nd scale decals sheet. There are enough variatons of the usual green/ grey scheme here as well for most people's tastes to find something unique in your own choice. Lastly the performance of these decals is excellent. 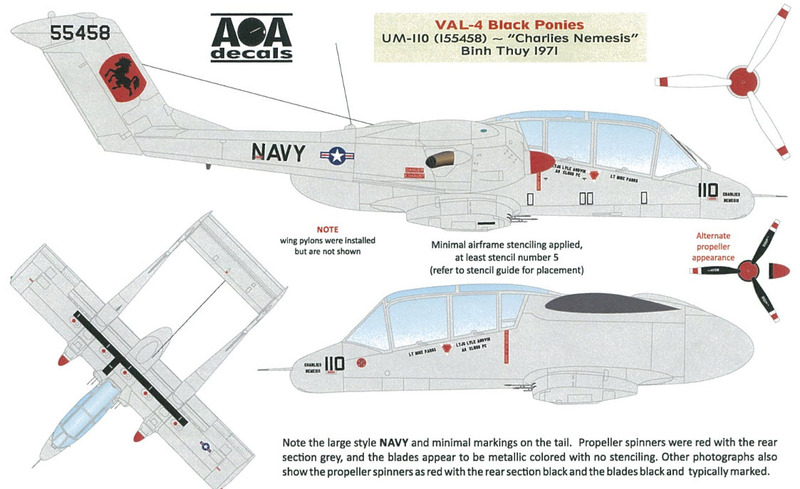 Cartograf have again won my trust and so you really can’t doubt a company’s work when they research something well and come up with a good product – I have seen many a good decal sheet with a lot less work put into them than these. 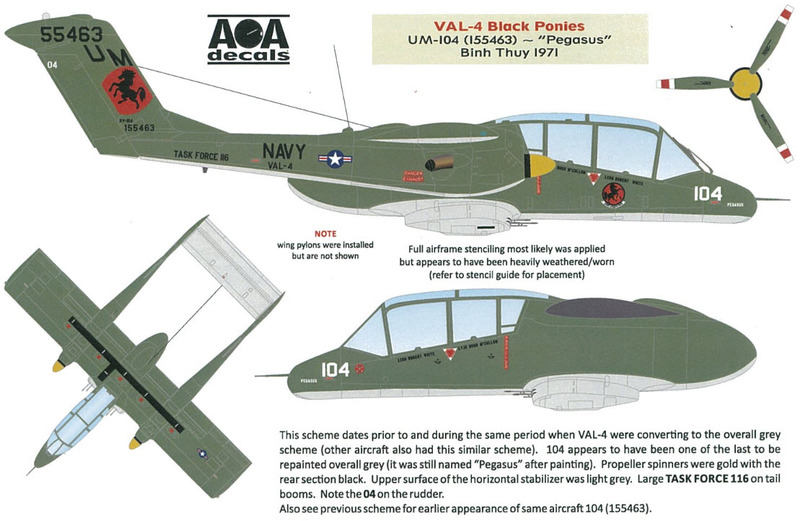 Great for your new Bronco and excellent job AOA!